Steel is more flexible than we think, as voestalpine Schienen GmbH proves when transporting its long rails. In demand around the world, these long rails, which are up to 120 m in length can be transported around curves with a radius of just 150 m. It’s a technical and logistical tour de force. 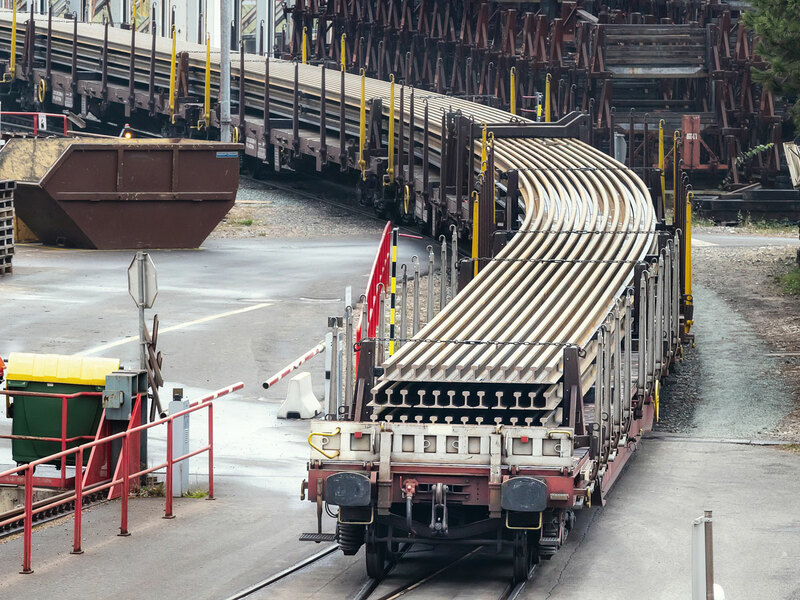 It’s a performance that railway enthusiasts never tire of watching: loading and transporting long rails is one of the most unusual activities that railway logistics offers, so that the voestalpine rail production plant in Donawitz becomes their Mecca. Up to ten sets of long rail shipments are loaded here each day. From here these worldwide popular voestalpine Schienen GmbH products start out on what is usually a long journey to Europe’s railway construction sites, transported to Austria’s border by the ÖBB, and from there onwards by a variety of national rail freight forwarders. voestalpine rails are as much in demand in Norway and Lithuania as they are in Switzerland, France and Romania. Up to 120 m in length, the steel elements are packed onto a maximum of eight consecutive flat wagons by a special crane. A standard load, spread over six wagons, is entered into the freight book at 250 tons in weight; a high-performance locomotive can pull three such sets of wagons. And when necessary, the rails are transported to the coast for shipment overseas to countries such as South Africa. In such cases the heavy freight is transferred onto a cargo ship at a port terminal. However, only rails up to a maximum length of 60 m can be transported by ship. 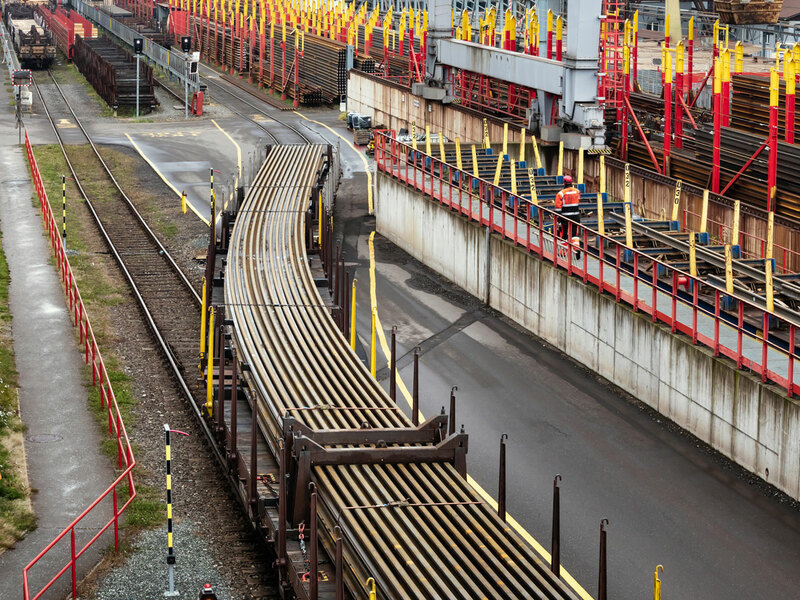 voestalpine Schienen GmbH is an expert in just-in-time deliveries of 120 m-long rails to construction sites throughout Europe, as well as 60 m-length rails to destinations overseas. Correct loading is an art form, not just at sea, but also on freight trains: the rails need sufficient space to move because they need to shift to accommodate curves on the route. They can be neither too firmly fixed, nor too loosely attached. It is only when you see with your own eyes how voestalpine rails synchronously bend in a wavelike manner as they travel, that you realize just how flexible tonnes of steel can be. But they really can be driven round tight curves with a radius of just 150 m.
Long rails can be transported around curves with a radius of just 150 m and more.